Travel in St Petersburg | Get Around the City! Wondering how to travel in St Petersburg? If so, you've come to the right place. Here you'll learn about all the different ways to get around the city. Getting around St Petersburg is much easier than before. Whereas in the past you needed to understand the Cyrillic alphabet to take the metro and/or other public transports, now you don’t need to know it. Lucky for you today most of the tourist information, metro signs and city maps, mostly located in the central part of the city, are in both Russian and English. Photos from Saint Petersburg, Russia. You should know that the city of St Petersburg has a huge public transport system, which will get you everywhere you want to go. Definitely, you will be delighted because the transportation is efficient, reliable and cheap, but still vintage. Each day of the week, from 6 am to just after midnight, you can choose from a variety of transport options. For example, you can take the Metro (faster, efficient and convenient); the Bus (efficient but slow and crowded); the Trolleybus or the Tram (efficient, but slow and old fashioned), the popular Marshrutka (faster, efficient, but not recommended if you don't speak Russian), or the Taxi (faster, comfortable and not expensive). In addition to that, you can also rent a Bike, if you like cycling and you don't mind traffic jams, or you can catch one of those new yellow boats, a sort of Water Taxi that will bring you from one island of the city to another, similar to the river cruise boats, but smaller in size and certainly not tourist routes. 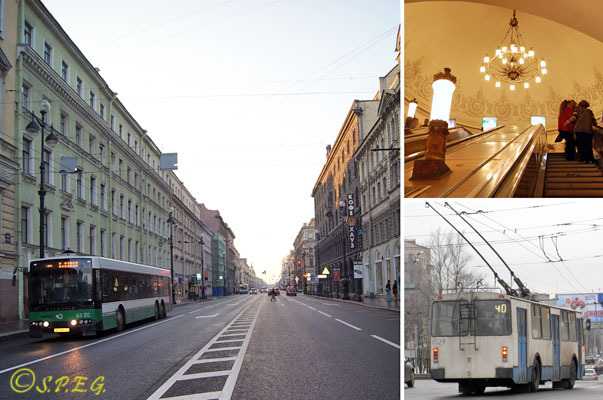 Want to know more about each type of public transportation in St Petersburg? If so keep reading below. To help you getting around the city we have summarized all the information you need to know about each form of transportation. To get started, just click on one of the travel options below. The Saint Petersburg Metro is extremely deep and beautiful, but not as extensive or extravagant as Moscow's Metro. It was dug by nearly free peasant labor in the 1930s and - after a break for World War II - finished in the 1950s. The metro has five colour-coded, numbered metro lines, and is one of the most popular means of transport among Petersburg residents. Definitely your best choice to travel in St Petersburg, and a must-see for first time visitors! The bus network in St Petersburg is cheap and very extensive, but not particularly easy for foreigners to use, especially if you cannot understand Cyrillic. There are different types of buses you can take and all bus stops are marked by signs with the letter "A", which stands for avtobus. The bus can be very busy during early morning and late afternoon. One can call St Petersburg a "City of Trams" because it has more trams than any other city in the world. The system of trams works pretty well, but is less extensive than the bus or trolleybus, and sometimes services can easily be disrupted by roadworks. Tram stops are marked with signs above the tracks (with a letter "T" on them), which stands for Tram. Almost identical from buses (although much more environmentally friendly), trolleybuses has an extensive network like the bus and the tram, and it's an other efficient way to travel in St Petersburg, though isn't a quick option, and like the bus can be very crowded during early morning and late afternoon. Russia's Northern capital is not a biker-friendly city, in fact you can barely see a bike lane, but the city is flat, so very easy to cycling around. However, when cycling on the street of Saint Petersburg you should be particularly careful at cars and at the holes. Russian drivers are known to be careless and driving fast, and the streets may have holes, depending in which area you go. So stay alert! There are a lot of local taxis in the Northern Capital, some are legal, other are not. You can find them anywhere in the city, especially along the major thoroughfares. To get a taxi, you can easily ask your hotel, flag down one on the street on your own, or much better, book one in advance on the internet through a third party system like Uber or Yandex. Unfortunately, Russian language can be an obstacle, so better you ask someone to help you with your booking. The Marshrutka is basically a private minibus running on a fixed route throughout the city. These minibuses are very popular in St. Petersburg as per the whole Russia because they are fast, cheap, on time, and particularly useful for getting to the suburbs, and anywhere in the city. Definitely a great option for Russians, but not really for foreigners unless Russian language can be understood. Known as Aquabus, these yellow taxi boats are a new public transport becoming very popular among Petersburg residents, mostly those living on the islands. They are inexpensive and offer three routes through the city and now one out to the island of Kronshtadt. For a visitor could be an interesting and cheap option to travel in St Petesburg, but limited and difficult if you don't speak Russian.